The freelance life loves a bit of serendipity. Last Spring, I bought a big notebook covered in old flying machines, because … well, I just liked it. Until then, Amy Johnson was simply a famous name from the past, someone mentioned now and then at home when I was a girl, because she’d been a celebrity when Mum was at school. I wish I’d paid more attention while I had the chance: ten months after buying that notebook, it’s full of all things Amy. I knew she was born in Hull. I knew she’d been the first woman to fly solo from England to Australia. I knew there was a statue of her outside the Prospect Centre (and yes, I even saw it unveiled). What I didn’t know was all the masses of stuff in between. When I took on the role of Living Amy Project Manager, the first thing I did was bury myself in Queen of the Air, the biography by Midge Gillies. The more pages I turned, the more fascinated I became and, when I reached the day by day account of Amy’s flight to Australia, it was more like reading a Girls Own adventure story. Next stop, the Science Museum in London. Staring and staring at her plane Jason suspended from the roof, thinking ‘all the way to Australia … in that?’ I was hooked. When the Living Amy submissions began flooding in, it was clear that, just like me, countless others were gripped by her story. We had so many applications and of such high quality that we commissioned 12 writers instead of 10. The aim of the commissions, supported by the James Reckitt Library Trust, was to find new ways of interpreting Amy’s life. The result? Three films, two shows, four promenade pieces, one workshop, a full colour comic, an online zine, seven sound installations, an ebook, two blogs, and an interactive game. Phew. What’s come through more than anything else is that Amy is very much a woman for today. One of the films – My Spirit Found Outlet in the Air, created by Ruth Carslaw with help from Hull Aero Club – took five 15 yr old girls from Hull Bridges project way up in the air over Bransholme. One of them had never flown before, let alone sat behind the controls of a tiny plane, banking high above her school, her house, tiny wind turbines. There were squeals, there were shrieks, there was a lot of grabbing onto one another, but most of all there was inspiration and an unforgettable sense of achievement. Another of the commissions featured ‘Emily’, a fictional lass from Hessle Road made of tough stuff. 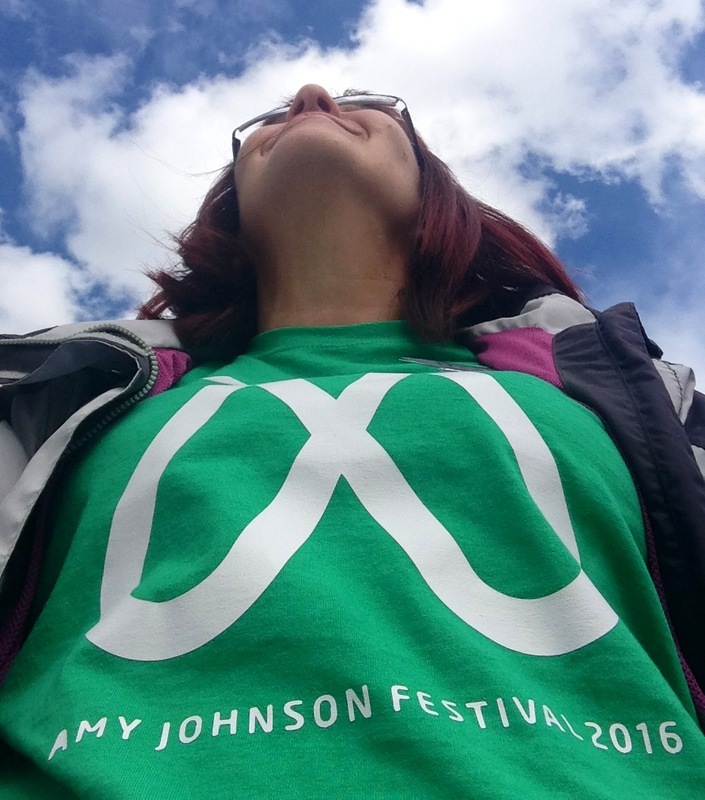 Her story, The Amy Johnson Fan Club, by award-winning writer Rob Young, mesmerised the audience at Kardomah94. Billed as ‘a funny little show that just might make you cry’, it did exactly that. I watched local actress Charlie Sellars perform it three times and the tears always came … but in a good way. We’re now hoping that, like so many of the Living Amy commissions, this ‘funny little show’ will leave a legacy long beyond the Festival. There could be plans to tour it to some schools in the city – watch this space! With most of the Living Amy commissions now well up and running, I’ve switched hats and goggles to turn to The Amy Johnson Scrapbook. It’s part of Untold Hull, a great project run by the Hull Libraries service. So most mornings you’ll find me ‘in residence’ in the Festival marquee, before heading off all over Hull and East Yorkshire with recording equipment. I’m busy gathering memories, anecdotes, stories and memorabilia from people with connections to Amy, however small or large. But I’m sure there’s lots more out there! As is the way with these things, each story or memory leaves a thread I want to pick up. Each photo presents people whose names I don’t know … and those people’s families will in turn have stories of their own. I’m so grateful there are people who listened to their mother’s memories of Amy more closely than I did. Hmmm. Time for another notebook.